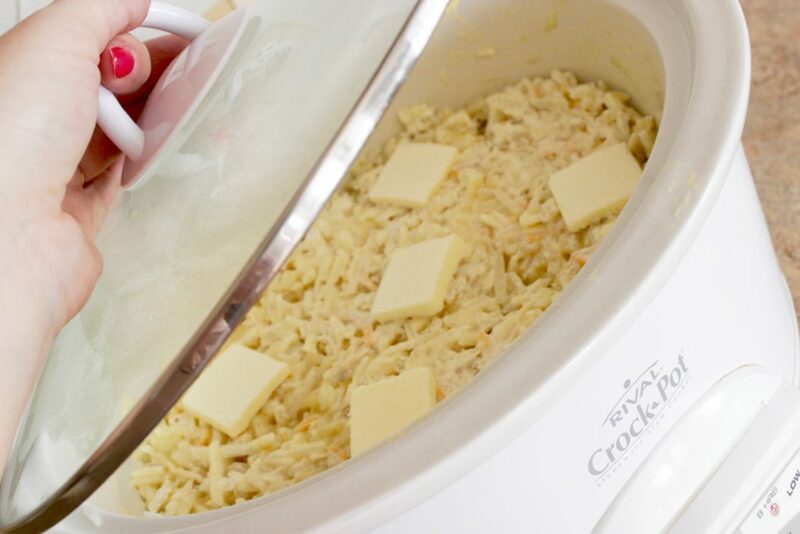 Crockpot Cheesy Potatoes Take 15 Minutes to Prepare! Looking for the perfect easy potato side dish? 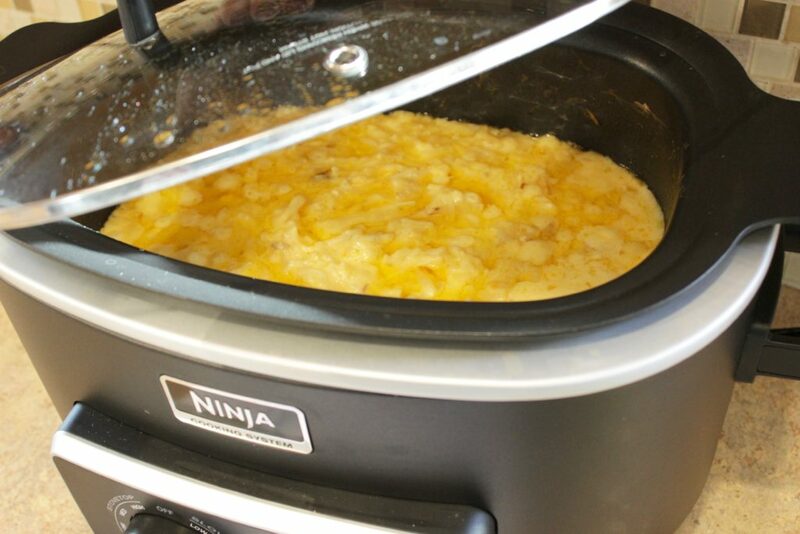 This Crockpot Cheesy Potatoes recipe is our family’s favorite. 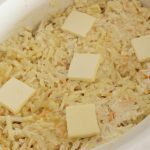 Not only is this cheesy slow cooker potatoes recipe my go-to holiday side dish recipe, but I also make this crock pot cheesy potatoes recipe several times a year as a side dish for grilled meat. At our house, every holiday meal gathering includes a potato side dish recipe on the table. Potato recipes pair well with ham or turkey, and even beef briskets are a great match for a potato side dish. 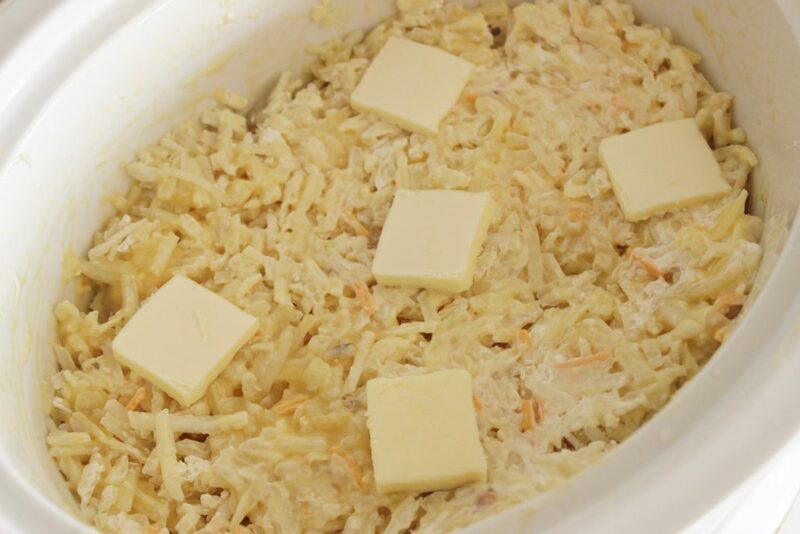 Can you make this cheesy Crockpot Potatoes recipe in the oven? Recently I shared my Cheesy Potatoes Bake Side Dish and people went nuts over it! That’s no surprise though, as it is really fantastic. I had several people ask though, both on social media and on the blog if they could make this dish in the crock pot and the answer is YES! You sure can. And, the best part about this Cheesy Potatoes Crock Pot recipe is that your oven is free for whatever else you need it for. Since it takes a little while longer to bake in the crock pot, you can run errands, go to church, play outside with the kids … whatever you need to do while they’re baking. I love crock pot recipes for this very reason! 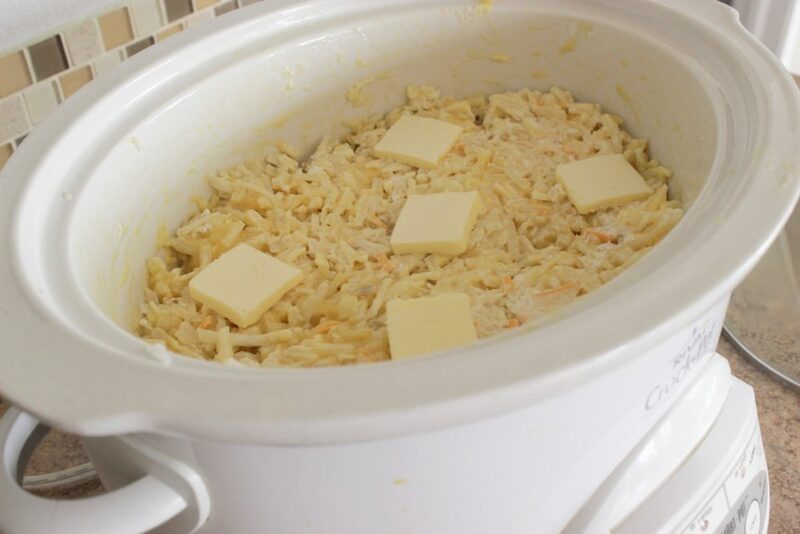 This crockpot cheesey potatoes recipe is basically the same recipe, but I wanted to be sure to have a post ready for it so that you could pin it for the next big meal you make. In a separate bowl, or right inside your crock pot, combine your frozen potatoes (thawed in the fridge for 2-6 hours is the way I prefer), diced onions, sour cream, 1 cup of cheese and cream of chicken soup and stir. The photo at the top of this pot in the Ninja Crock Pot has milk. The photos in the white crock pot do not have milk, if that helps you gauge what it will look like when finished. When you’re finished mixing everything, top the crockpot cheese potatoes with pads of butter and cook on high for 2 hours. You could also melt the butter and add it into the cheesy potatoes crock pot recipe as you’re adding everything else, that’s a personal preference. Sprinkle with remaining 1/2 cup of cheese until melted and enjoy. That’s really it! I can’t even pretend that this crockpot potato casserole is hard. ** I do want to say though that the second can of soup is key to this recipe being amazing. I have seen several people mention that their slow cooker cheesy potatoes recipe calls for only one can of soup. The recipe that I used to use called for only one can as well. But, the difference between one can of soup and two cans of soup is monumental. It’s worth mentioning, too that you can make your own cream of chicken soup rather than using the Campbell’s cream of soups. I don’t because at this time in my life, the ease of using the canned cream of soups is worth it, but I might in the future when I have more time to do fun things like that. These cheesy potatoes are so good and since they're made in the crock pot, they're insanely easy as well. Win-win! Combine all ingredients minus the butter in the crock pot. I have been making a similar recipe for years, only I use the cubed hash browns and add green onions to the mix. I melt butter and pour on top. Refrigerate over night and bake at 350 for 1 hr and 15 min. Will try your recipe for Easter-thanks! Yum, I’ve never added green onions but that sounds good, too! Thanks for sharing and stopping by, Linda! I hope I’m not getting back to you too late. I also have a Cheesy Potatoes recipe that I make in the oven. You can find that post here. I don’t cover it if that helps. How big of a bag of hash browns do you use for this recipe? I want to do a trial run of this to see the timing on it as I need to make a few crocks full of this for a graduation party. What other kind of cream soup can be used if you don’t want to use cream of chicken? Can a different cream soup be used if you don’t want to cream of chicken?